This is a design for a basic trailer that will carry a canoe. The trailer is built on a Harbor Freight 4x8ft trailer kit and has a 4x8ft body made entirely of flat panels. The purpose of the design was to provide two simple roof bars, as far apart as possible, on which a canoe could be carried - unless a heavier and wider chassis is used, a canoe is probably the maximum weight that it is sensible to put on top of this trailer. 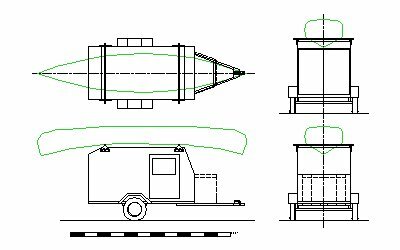 The galley of the trailer is accessed in two ways: when the canoe is on top, just the two rear doors are used to get at the galley and when the canoe is not on the trailer, the small rear roof panel can be opened to make access easier.